Church in the partially submerged old colonial town of Guerrero Viejo that is a common sightseeing destination on the Mexican side of Falcon Lake on the South Texas-Mexico border. A U.S. couple was returning from the site Thursday afternoon when they were intercepted by gunmen on the lake. The husband was reportedly shot, his fate is unknown. Gunmen presumed to be Mexican drug operatives opened fire today on a couple riding water skis on the binational Falcon Lake reservoir Thursday afternoon, possibly killing the husband and sending the woman fleeing frantically to the U.S. side. Zapata County Sheriff Sigifredo Gonzalez said the couple, believed to be from McAllen, Texas, had crossed to the Mexican side when they came under a spray of bullets by two boatloads of men. The man, 30, was shot in the head and his wife said she fears he is dead. Gonzalez said the couple never spoke to the gunmen. 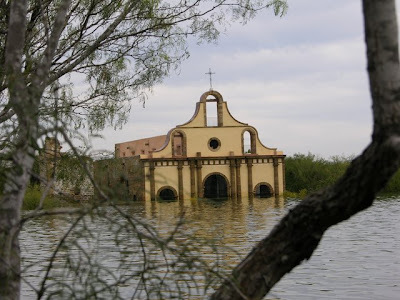 He said the couple had ridden over to Mexico for sightseeing and to take photos of a famous church in Old Guerrero. “I do know that it happened on the Mexican side, that's what's making the investigation very difficult,” she said. However, one of the boats may have crossed to the U.S. side of the lake to fire at the woman, said Mike Cox, a spokesman for the Texas Parks & Wildlife Department. The shooting follows reports in May that boaters in the famed bass fishing oasis were at risk of being shaken down by “pirates” lurking on the Mexican side. Thursday's reported shooting comes during what may be the most deadly and prolonged streak of Mexican drug cartel violence in memory. $3.1 million seized at McAllen border crossing. The bus passengers thought they were making a quick few thousand dollars just for carrying bags on a bus across the Texas-Mexico border. One was recruited in an Atlanta coin laundry, another at a nightclub and one more handed a bag from a stranger in Charlotte, N.C. Almost all knew they likely were carrying something illicit. Each of the passenger's bags contained a deflated Coleman air mattress rolled up around hundreds of thousands of dollars. All totaled, Customs and Border Protection nabbed $3.1 million, officials announced Wednesday. It was a banner moment for the feds, who've been putting more and more resources into tracking what leaves the country as well as what enters. The aim is to make it harder to get guns and illicit cash back to the cartel bosses waging an increasingly violent war over drug corridors through Mexico. 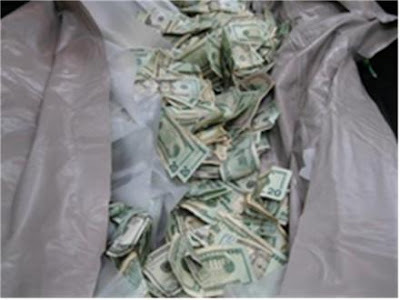 “The seizure of $3.1 million in undeclared currency and 14 arrests, the largest currency seizure by CBP in fiscal year 2010, is a magnificent achievement and serves as validation of our enhanced outbound enforcement effort,” CBP Commissioner Alan Bersin said. A Justice Department spokeswoman said it would be speculative to say whether the cash, which showed up Sunday as odd shapes in X-ray scans at the Hidalgo-Reynosa International Bridge, had a common origin or destination. The case differs from several large seizures on tour buses because the cash was dispersed and defendants claimed the bags. In previous cases, cash seizures have been reported without immediate reports of arrests. Seven of the arrested passengers were U.S. citizens age 18 to 22; the other seven were from Mexico and age 40 to 51. Bianca Tapia-Pineda, 20, said she and a friend earned $1,000 each and were to earn $7,000 more after traveling to Charlotte to pick up one bag each from an unidentified man. Her bag contained $234,940. But the friend, 50-year-old Mexican citizen Margarita Jones, carrying $229,000, said she made a deal with a woman she met while shopping. Gabriella Hernandez, 18, said her brother enlisted her to take a bag she knew contained “something bad, maybe drugs,” to Mexico. She and her brother each pocketed several hundred dollars before boarding the bus with expectations of thousands of dollars more. The bag she claimed contained $220,160. Her brother, Jobanni Hernandez, had a bag containing $220,140. Maria Urieta, a 48-year-old Mexican citizen, said a stranger approached her at an Atlanta laundry and offered her $700 to transport a bag. She told a special agent with U.S. Immigration and Customs Enforcement she thought the bag contained used clothing. It contained $230,000. They and the others were charged Wednesday with conspiring to evade currency transaction reporting requirements following an ICE investigation into the matter. It's illegal to carry more than $10,000 in or out of the United States without making a declaration. A detention hearing is set Friday in federal court in McAllen. 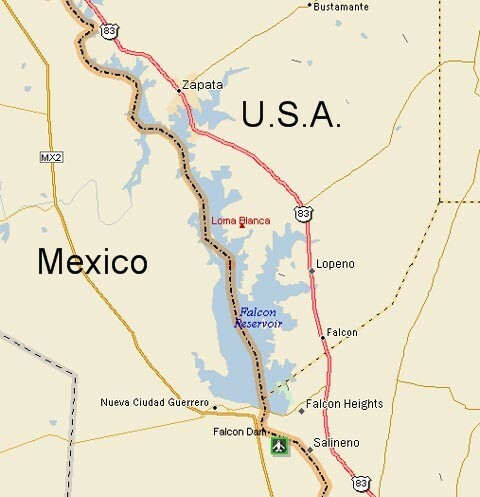 The passengers were on an Autobuses Tierra Caliente coach, which appears to be based near Dallas, but made stops there as well as in Atlanta, North Carolina, Austin, San Marcos and Laredo. Those arrested still are in custody. The bus was not seized and the driver wasn't charged. The company is not accused of wrongdoing. It is unclear why all the couriers were on the same bus and why CBP and ICE inspectors decided to examine it. Mike Vigil, a retired ranking Drug Enforcement Administration agent, now the executive director of ManTech International, a global logistics and information technology firm, said it was absurd to smuggle this way. “I would never, ever put all my eggs in the same basket,” he said. “Whoever hired them and whoever gave them instructions, were probably neophytes. Said John Morton, director of Immigration and Customs Enforcement: “This seizure puts smugglers on notice. 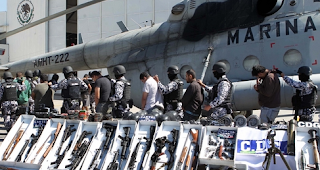 Mexican marines arrested 30 suspected Gulf drug cartel members in different operations this week in the northeastern state of Tamaulipas, the Navy Secretariat said. The suspects were paraded before reporters on Wednesday. The arrests were made possible by the efforts of naval intelligence officers and information received from the Center for Intelligence and National Security, or Cisen, the Navy Secretariat said. The operations launched by marines are designed to dismantle criminal organizations, the secretariat said. “Several operations were conducted that yielded the arrests of 30 suspects involved in the commission of illicit activities, as well as the (seizure) of arms, materiel and cash,” the Navy Secretariat said. Marines seized two vehicles, 43 rifles, 10 handguns, two rocket launchers, a rocket, 318 ammunition clips, 21 hand grenades, more than 1,000 rounds of ammunition, 10 bullet-proof helmets, six bullet-proof vests, 44 Gulf cartel emblems, communications gear and military uniforms. The suspects and the property seized in the operations were handed over to prosecutors. Mexico’s most powerful drug trafficking organizations, according to experts, are the Sinaloa, Tijuana, Gulf, Juarez, Los Zetas and Beltran Leyva cartels, and La Familia Michoacana. The Gulf cartel was founded by Juan Nepomuceno Guerra in the 1970s and later led by Juan Garcia Abrego, who was arrested in 1996 and extradited to the United States. 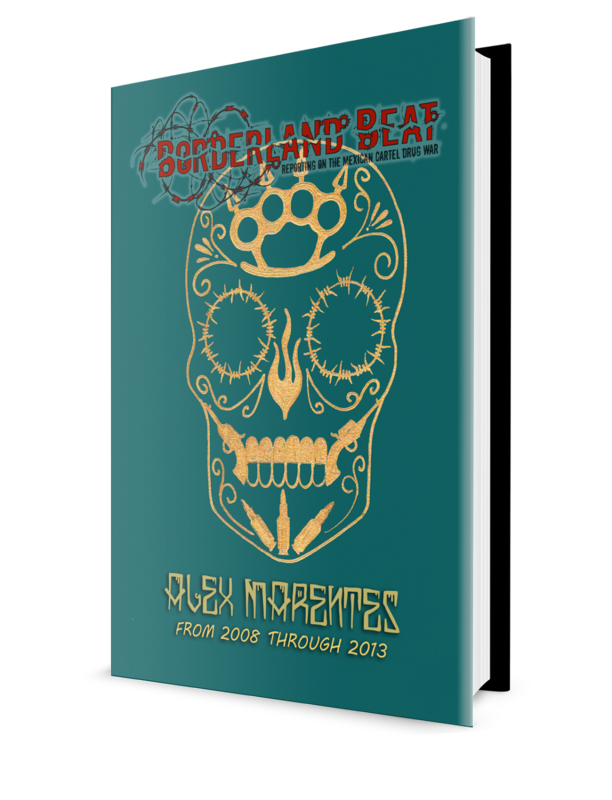 The Gulf cartel has been waging a war in northeastern Mexico against Los Zetas, a band of Mexican special forces deserters turned hired guns. 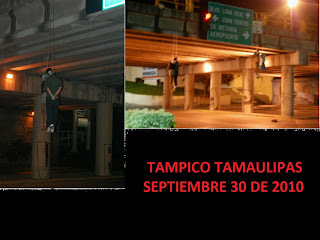 The bodies of three men and one woman were found hanging from a bridge in Cuidad de Tampico in the state of Tamaulipas. The corpses were discovered around 5:30 in the commercial and finacial zones of the city. Members of the Mexican army quickly removed them. These types of killing and beheading are increasing on the border, especially in this state which has seen a bitter war of attrition between remnants of the Gulf cartel and their former allies Los Zetas. Two male bodies are found partially clothed in the Infonavit Angel Trians zone of Juarez. Both were severely beaten but had no obvious gunshot wounds. A vendor is shot as he sells newspapers the dangerous streets. According to police, the murderers fired six shots from a vehicle before fleeing the scene. 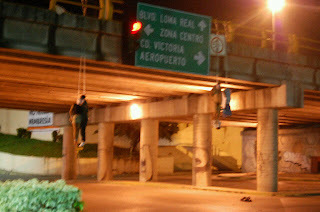 Two federal police officers are executed in the central zone of Cuidad Juarez. The officers were standing at the entrance of the Hotel Verde when they were fired upon by masked gunmen. Rumors indicate both victims had been doing intelligence work and that may be a motive for the crime, although no official statements have confirmed this. On Sunday police arrested a suspect in the Juarez car bombing in July that killed three people and a man who was killed and used as bait to lure investigators to the scene. José Iván Contreras Lumbreras, known as El Keiko, placed the vehicle laden with explosives that killed a paramedic, and two police officers. He is also suspected of a car bombing in Bolivia on September 16th. El Keiko is a member of la Linea and is also part of kidnapping ring that operates in the city of Juarez. A man's body is found calcinado or burned to a crisp in a Nissan Pathfinder on the street Villa De las Palmas in Tijuana. Although there are no witnesses or evidence the vehicle has been there for the last 24 - 36 hours before authorities secured the crime scene. MONTERREY, Mexico (AP) - Two men were arrested for killing a small-town Mexican mayor over a land dispute in a $6,000 contract killing, prosecutors said Thursday. 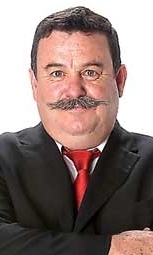 Nuevo Leon state Attorney General Alejandro Garza y Garza ruled out the involvement of drug gangs that have been blamed for the assassination of many other mayors in Mexico. Prisciliano Rodriguez, mayor of Doctor Gonzalez, was gunned down Sept. 23 along with an aide. He was the fourth mayor killed in northeastern Mexico in a month. Garza y Garza said the two detained men confessed to killing the mayor over a land dispute. He said an uncle of one of the two suspects hired them a week before the assassination, asking them if they "wanted a little job." The uncle remains at large. The men were paid an initial $3,000 and given an R-15 rifle, an Uzi and a revolver, Garza y Garza said. On the day of the assassination, the uncle called his nephew and demanded the money back if they did not carry out the killing, the prosecutor said. The suspects told police they traveled later that day to Doctor Gonzalez, where the mayor was coordinating a program to provide metal roofing to residents, Garza y Garza said. He said the pair waited until Rodriguez got out of his car and opened fire about 20 times. The uncle allegedly met with them later that day and paid them the remaining $3,000. Police recovered guns buried in the backyard of one of the suspects, and are checking them to determine if they matched those used in the assassination, Garza y Garza said. He did not give details of the land dispute.Small-town mayors are frequently assassinated in Mexico. Land disputes are sometimes the motive, but most attacks have been blamed on drug gangs that have tried to use isolated, lightly patrolled towns to hide and hold kidnap victims, weapons and drugs. The District Attorney for the state of Baja California has received confessions from members of a gang known as Los Teos, who were captured after information from a kidnapped victim led to their arrest. The men worked in cells managed by Hector Guadardo Hernandez, El Guicho and Juan Miguel Valles Beltran, El Boxer and they have been implicated in several homicides of police officers since 2009. Investigators are waiting on ballistics reports to see which executions the detainees participated in. Authorities say a series of arrests deal a triple blow to the cells of El Guicho. One of the men was a known kidnapper, the other two were sicarios for the group. All were captured during a three day investigation which also led to the release of two kidnapping victims being held by the Los Teos gang. 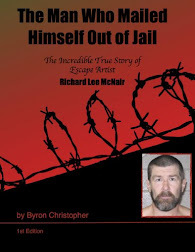 The downfall of the cell began the evening of Monday September 21rst, when state police came across a young man nervous and shivering in his underwear, wandering through the streets of colonia Villas de Baja California de Tijuana. The youth informed the officers that he and his uncle had been the victims of a kidnapping by a group of five armed men who were traveling in a Honda CRV. He related to patrolmen that the two men had been abducted at gunpoint and taken to an office in building in the same colonia. Officers then called for backup to the secure location of the suspects. They were met by Erick Adrian Lamas Tello, 18 years old who was in possession of an Uzi 9mm sub machine gun and was standing guard over the youths' uncle, who was laying on the floor, his hands and feet had been crudely tied with an electrical cord. At the scene officers secured another 9mm pistol and several clips of ammunition. Acting on information from Lamas, state police raided a nearby safehouse that seemed to turn up nothing until the morning of the 22nd. This time in colonia Sanchez Taboada de Tijuana, at the intersection of Gemini and Virgo, police patrolling the area followed a vehicle that was speeding excessively without regard for officer's presence. When officers stopped the grey Volkswagen Passat they found Alejandro Moreno Tinajero, age 27 and Jose Cristobal Perez, age 35 in possession of two fully loaded handguns; a .40 caliber Glock and a Smith and Wesson 9mm. The pair confessed that the handguns belonged to Rodolfo Gomez, 'El Pienetas' or 'El Rodolf' age 45, who had sent them to kill a man whose name they didn't know. Jose Cristobal Perez was more detailed in his confession and revealed that he lived in Guadalajara and belonged to the Mileno Cartel, his main duties consisted of killing and kidnapping rivals at the order of Felipe Acosta, alias El Pecas who in turn received his orders from El Choco, El Pelon who in turn took orders from M or Mecho, the presumed leader of the organization. He also said he had only been in Tijuana a few days when most of the members of his cell were detained during a military operation in Jalisco. He was lucky enough to escape that incident and had since found “work” with Rodolfo Gomez. When Perez lead them to the safehouse he had been staying at, the investigators realized this was the same domicile they had raided and rescued the young man and his uncle the previous night. Edgar Sabino Aburto Lince and Antonio Flores Zapata at their presentation. The third blow was dealt to the group on Tuesday the 23rd on the boulevard of Benito Juarez de playas de Rosarito, when police saw two men acting suspiciously and trying to duck behind cars when they say the patrolmen. Upon searching the two suspects, officers found a pair of loaded handguns on Edgar Sabino Aburto Lince, age 24 and luis Antonio Flores Zapata, age 21. The latter confessed to the murder of a man in colonia Constitucion a week earlier. Both admitted to being members of an organized crime ring led by Juan Miguel Valles Beltran, El Boxer who was running a sub-set of the larger gang known as Los Teos under the guidance of El Guicho. Lince and Zapata were operating in various cells in Tijuana for Los Teos and are believed to be responsible for the murder of several civilians and police officers in relation to the sale of drugs, including an attack on municipal officers on October 27th 2009 and the murder of Rogelio Sanchez Jimenz, functionary of the Finance Secretary for the State government, whose body was found hanging from a bridge in Tijuana on the 9th of October the same year. A week before the incident on the 21rst, Erick Adrian Llama Tello had been detained with several small caliber weapons. On that occasion police took the weapons as evidence and submitted them for ballistic analysis to see if they had been used in previous murders. The problem was nobody processed the guns or the report, then a week later Llamas turns up along with five others as suspects in a kidnapping case using firearms that may or may not have already been taken in as evidence. To date, the authorities of the state are still awaiting the ballistics report from the State Prosecutors office to determine which of the men arrested participated in murders El Guicho's men have been implicated in. It is an old video, shot before the July 4th gubernatorial and mayoral elections this year in Chihuahua. We can date it accurately because the body of the man you are listening to, Miguel Angel Acosta Peralta, was one of four execution victims hung from highway overpasses in the city of Chihuahua, the capitol of the state also named Chihuahua, on the morning of July 4th. We learn that a cell of Sinaloa cartel gunmen has been captured in the city Chihuahua, which like Ciudad Juarez, is a battleground between Chapo Guzman’s “gente nueva” and the Juarez cartel. They are probably prisoners of “La Linea”, the Juarez cartel’s paramilitary gunmen. It is the same monologue by a captured gangster, “soltando la sopa” or spilling the beans in narco slang, and the same weary brutality inflicted on the now powerless captive who was surely living the gangster lifestyle hours before his starring role in his own tragedy. It is likely that he was also delivering the same pain on his own victims. It is a testament to our humanity if we feel sympathy for Miguel, for he probably would not have any for you. The video begins with the captive introducing himself and naming his cell leader and the hierarchy up to Chapo Guzman. It is hard to tell if he has been coached on his answers, either way his recall seems very clear under duress. He tells us that his cell is under the command of “el Flaco” Salgueiro, an important trafficker from Durango who allegedly works directly under Chapo Guzman. “El Flaco” and his band are believed to be responsible for the kidnapping and deaths in 2008 of two prominent members of the Mormon community in Chihuahua, Benjamin LeBaron and Luis Widmar. Thenty eight seconds into the video Miguel Acosta names a General Felipe de Jesus Espitia as being under the control of Chapo Guzman. It is hard to imagine someone at the organizational level of Acosta having this knowledge of corruption at the highest levels. Maybe it was common knowledge or maybe he was coached by his captors to repeat this accusation. In April of this year La Linea accused General Espitia, who at that time was the commander of the military’s Fifth Military Zone which includes Chihuahua, of reneging on an agreement to co-operate with La Linea and aligning himself with the Sinaloa cartel instead. The accusation was publicized on narco banners in April that stated the General was Chapo’s right hand in Chihuahua. 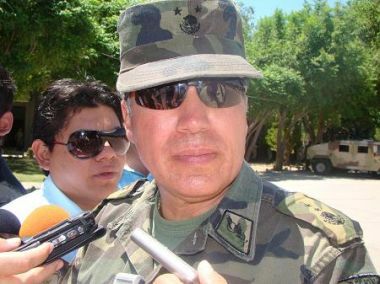 On July 1st of this year General Espitia was relieved of command of The Fifth Military Zone and the Joint Coordinated Operation Chihuahua, the operation responsible for command of Federal Police and the Army in the fight against drug trafficking. He had been in command for 2 years and 3 months. General Espitia was given command of a Mexican Air Force base in Santa Gertrudis, Chihuahua. The military high command would only state that the transfer of duties was due to normal rotation of commanders. It is not known if General Espidia was investigated for links to organized crime. Since 2008, human rights lawyers in Chihuahua have documented 170 cases of soldiers under the command of General Espitia being involved in kidnapping, torturing and extorting civilians. At 45 seconds into the video Miguel Acosta states that his cell leader, Rolando Valdez Villaseñor, works in collusion with two Federal Police officials, “agente Lemos” and “agente Ricardo”. Acosta accuses the federal policemen of committing extortion, kidnapping, armed robbery, car theft and dealing in drugs and arms, and homicide. Acosta then names the locations of several safe houses with arms and vehicles used by corrupt Federal Police forces and Sinaloa cartel cells. These were exactly the same crimes that Federal Police mutineers in Juarez accused their superiors of committing during the one day uprising in Ciudad Juarez last month. At 2 minutes 30 seconds Acosta begins to describe the operations of the Sinaloa cartel in the CERESO prison located in Aquiles Serdan , a municipality neighboring Chihuahua city. He states that members of the Mexicles prison gang under the command of the Sinaloa cartel and incarcerated in the Serdan CERESO are sent out from the prison to commit homicides and kidnappings. This video actually predates the video of the policeman captured by Zetas who describes in detail the mass murders perpetrated by inmates of the CERESO prison in Gomez Palacio, Durango. 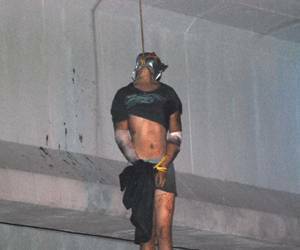 One of the bodies hung from the highway bridges on the morning of July 4th was that of a prison official, Juan Scott, who worked at the Serdan CERESO. Acosta then describes where cocaine is sold to local drug consumers . He continues naming other members of the Sinaloa Cartel who traffic drugs and commit kidnappings and contract murders in Chihuahua. At 4 minutes and 55 seconds the camera pans to Acosta’s right into another room where eight bound and blindfolded men are laying on the floor. Acosta describes them as Sinaloa Cartel sicarios, or contract killers. He also describes how stolen vehicles were used and rotated among the captured sicarios. On the morning of July 4th, in addition to Acosta and Juan Scott, the bodies of eight other men were found executed in Chihuahua city. Police officials said at that time that all 10 men had been murdered by the same group of gunmen, due to the fact that all 10 men were bound with the same brand of yellow plastic tie handcuffs. In the video Acosta is seen bound behind his back with steel handcuffs but in the photo where his body is hung from the bridge he is bound with the same yellow handcuffs with his hands in front. At the end of his monologue Acosta describes how his cell leader, Rolando Villaseñor, betrayed him and sent a group of soldiers to kill him but he managed to buy his life from the soldiers for 120,000 pesos and his vehicles. At 6 minutes 36 seconds, the inevitable begins horribly for Miguel Acosta. In addition to this video a second video was also released. This video shows gunmen belonging to the Sinaloa cartel in their safehouse and in the streets of Chihuahua in broad daylight displaying their power to the local citizens. This video was probably captured along with one of the bound sicarios shown in the video and executed soon after. And so ends the story of 10 more deaths in this conflict. Can we believe the claims of collusion by government officials documented here, were they just propaganda or the truth? And if they are true how can the claims of progress by the government against corruption be believed?